I had been studying as I have mentioned with Jose Giro who'se family owned the Ossa factory. He told me. 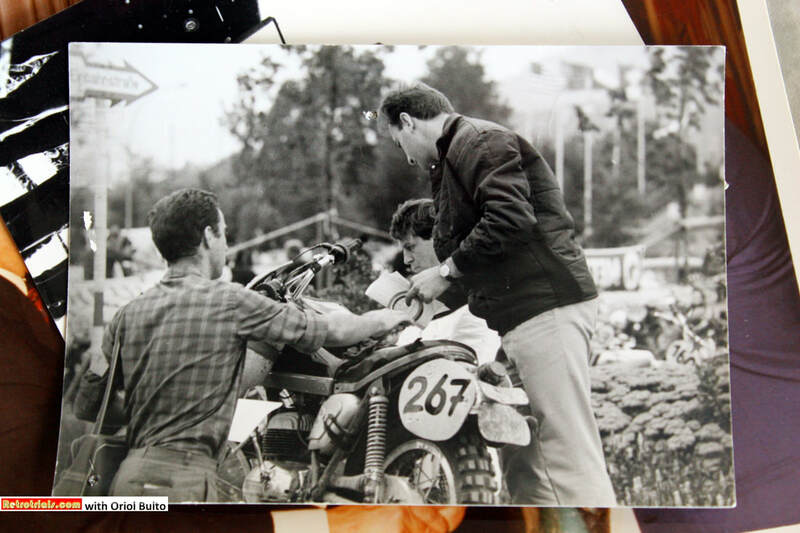 "Look Oriol your uncle has left Montesa so you are not riding Montesa. 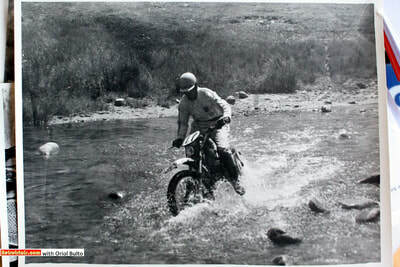 Ossa is going to the six days in Garmisch Partenkirchen. Would you like to ride with Ossa ?". I said yes I would like this , but first I must ask my uncle. 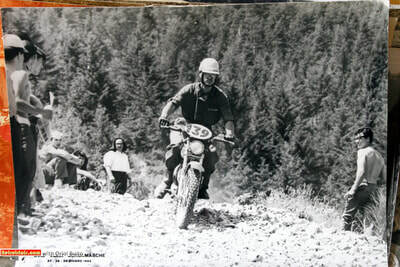 We were so attached to one another that my feeling was that I should ask my uncle if I was to ride for another brand not Montesa and of course at this time Bultaco did not exist. ​He told me ok of course you can go ,so my first six days was with Ossa . There were three Ossa's in the team and one was a 75 cc with the Morini 4 stroke engine and 3 with the 160 2 stroke. I learnt much from this time. 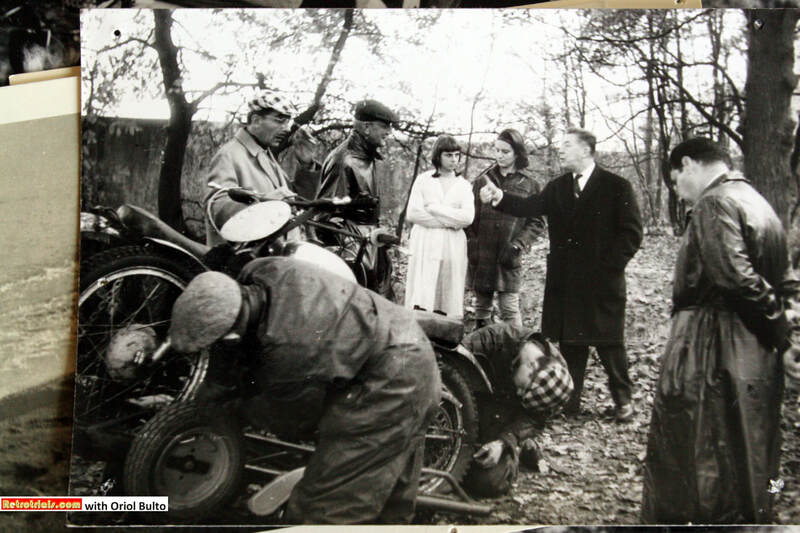 The air induction was coming from the air box on the side and all of the water and mud was coming from the rear tyre and it was directed immediately at the airbox ,and of course the mud would enter the airbox and then the engine and piston. 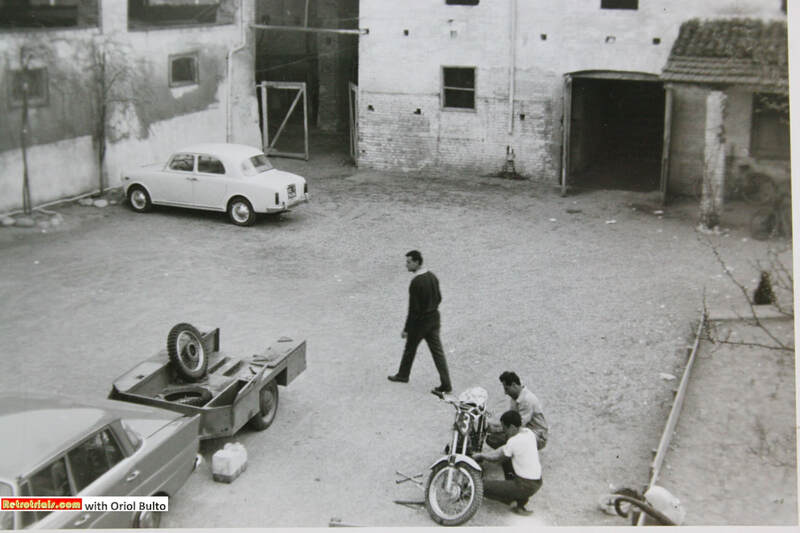 On the third day the piston rings were finished and there were no more Ossa racing. 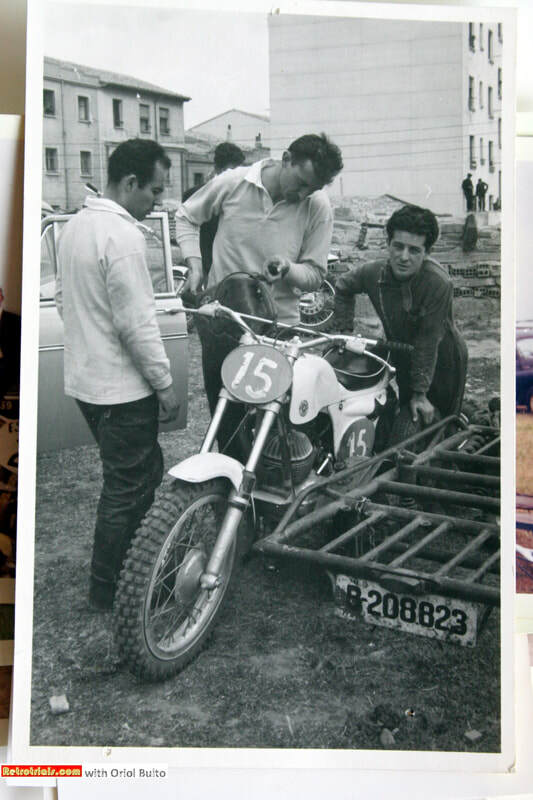 But this experience helped me to develop the Bultaco 1962 with Pepe Sanchez. After we had done this, we said ok let's go and try this bike. 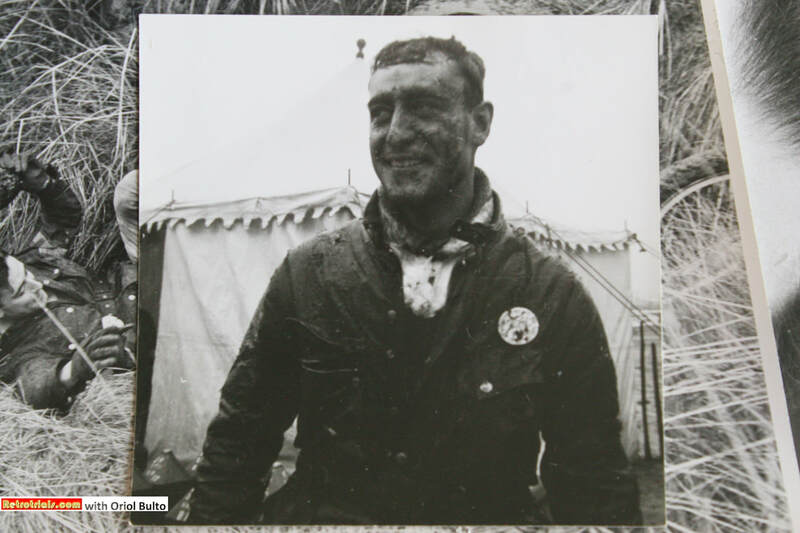 You see , we had taken a Sherpa s and modified and prepared specially the bike for the protection from the mud and the water and the Electrics were also protected especially. Then we went to Garmisch and it was good because we were lucky because on the way to Garmisch ...... Oh I must say that when I see the huge trucks and the riders flying to the events around the World ,it was so different for us ,because at this time I only had a Seat 600 motor car which was a very small motor car. However to go to Garmisch, my father let me have his Renault Dauphine with the trailer. 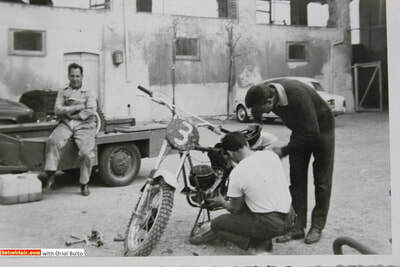 A great photo that speaks volumes .Oriol can be seen on his knees with the famous Bulto chequered hat . Paco is clearly having a very active discussion with another male who is getting very animated. Paco's daughter in the white behind. On this trailer we will carry the two motorcycles and the spare engine for parts and we went to Garmisch, just myself and Pepe Sanchez. No mechanics ,no assistance, nothing ha ha then. On the way to Garmisch we stop in Monza because the Bultaco road racing team were participating in the Italian Grand Prix here. This was certainly the week before the race we had in Garmisch. 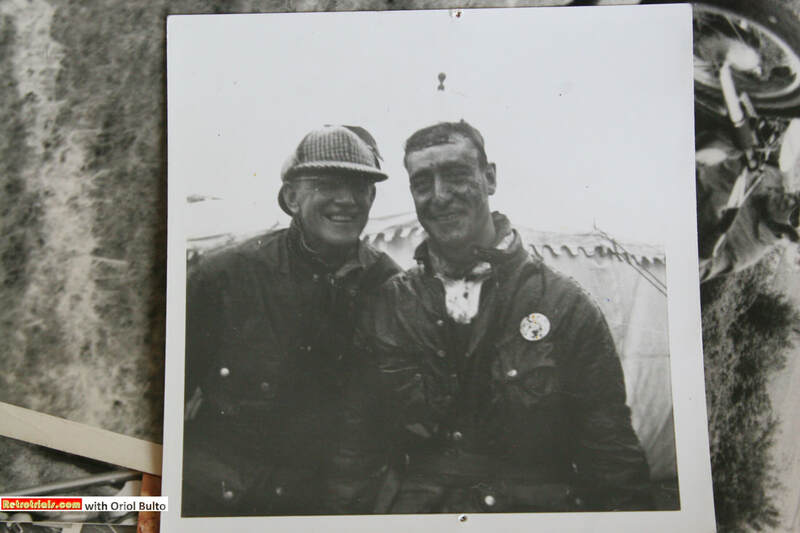 When we arrived at the circuit we met my Uncle John Grace and the rest of the team . 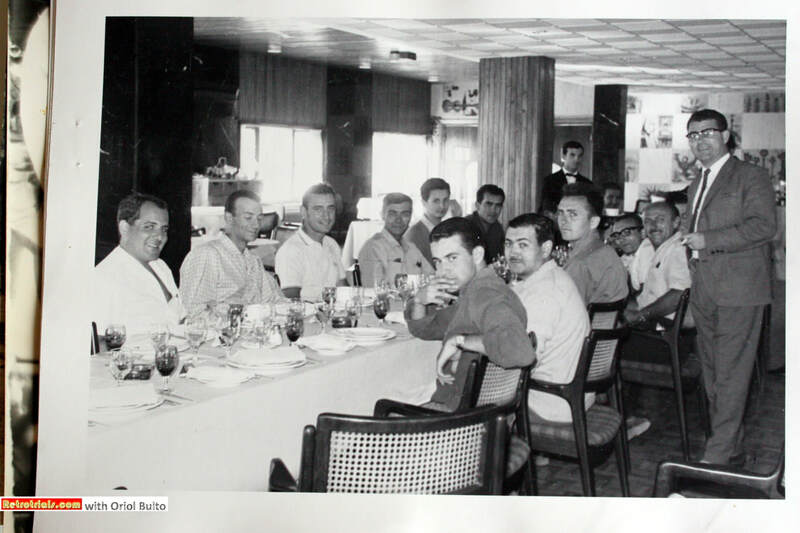 We all there had lunch in Monza and then John Grace who was later the manager of the Bultaco American company. John Grace was from Gibraltar and his real name on his passport was Juan Gracia ? I think a lunch in Sierra Nevada (Granada) after the ascent to the mountain Pico Veleta (altitude 3.398 m.) on Bultacos Sherpa T.